Admittedly, I’ve not been much into meal plans or food by the time dinner rolls around the last few weeks of this pregnancy. We keep enough on hand to provide the girls with real-food lunches and dinners, but once they’re in bed, pretty much all I want is a great big smoothie topped with granola. Once I hit the 38-week mark, however, I realized that I’d been pillaging the freezer to help supplement my non-planning, and things were looking pretty bleak with this little one’s arrival on the horizon. So last week, I order $178 worth of groceries from Harris Teeter Express Lane (seriously, probably the best gift I’ve ever received besides my crockpot is an annual subscription to Express Lane. Before the subscription, I’d feel the need to order at least $60 worth of things to justify the $4.95 charge, but now I’m like, “1 roll of paper towels? Yep, Express Laning that.”) and planned 11 entrees and 4 breakfasts to stash in our freezer for those early 3 under 3.5 days. Over the course of about 3 days last week I knocked most of them out, and I’m thrilled with what’s waiting for us in there. In fact, I may thaw one tonight just because I have a hankering for pot pie. Also, one thing I didn’t plan was disposable casserole dishes, so the first night I made a couple in regular casserole dishes and realized, “ya idiot, how are you going to freeze this without freezer burn, and how are you going to heat it without cracking the dish?” I ran to Publix and put my non-existent finesse skills to work and mostly successfully transferred those into disposable pans with lids. Chocolate Chip Oatmeal Pancakes – Nora Beth doesn’t love chocolate chips in her pancakes (whose child is she?? 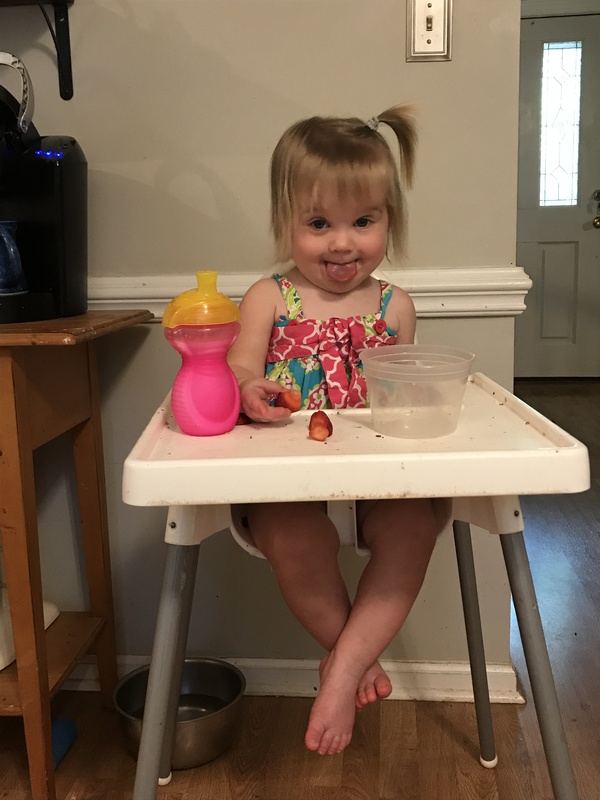 ), and Annablair can’t get enough “mup-mins” (any type of pancake, muffin, bread or noodle… especially those with chocolate chips inside), but both girls LOVE these, and I love that they’re on the healthier side for a sweet breakfast food. I use regular eggs and regular flour, and I always double the batch. They freeze and reheat great. Baked Oatmeal – this is a family favorite. I haven’t ever frozen it, but I think it would do well. We go through the casserole dish in about a week, and even by the very last serving, it reheats super well. This is also incredibly versatile, and I always add berries (frozen work great here), and sometimes I add a layer of bananas topped with brown sugar, a little bit of butter, and cinnamon to the bottom to create a bananas foster effect. I almost always use vegetable oil instead of apple sauce, because I tend to have it in my cabinet more often. Berry Smashed Muffins – a typical breakfast for the girls is some type of carb (as observed by this list), yogurt (“oooogurt,” per Blairzy, because both of them are yogurt FANATICS) and a fruit or egg situation. These berry muffins are a breeze to make and perfect if you have some berries needing to be used. I’ve only tried strawberry, but I’m sure blueberry, raspberry or blackberry would be great too. I double the batch to keep some in the freezer, and the last time Annablair was teething, I let her gnaw on one straight from the freezer, which was a hit. Healthy Banana Chocolate Chip Muffins – add one more to our muffin repertoire. Warning for little hands… these are pretty crumbly, and while delicious, they do leave behind a mess under chairs and high chairs. I love to eat mine warmed up with a little smear of peanut butter. I’ve made these with almond flour, oat flour AND regular flour, and they always turn out well, so whatever is in my pantry is what I dump in. I think I may like the oat flour the best, if you forced me to choose. Best Anytime Baked Chicken Meatballs – Pinch of Yum is almost always my starting point for meal plans, and I knew these meatballs would be a hit with the girls. I made one batch and split it between the fridge and freezer, but they quickly ate their way through the fridge portion (even asking for them for breakfast the next day…? ), so I ordered another pound of ground chicken (thanks, Express Lane!) to make more today. I served them alongside our favorite Costco cheese tortellini and frozen peas, but really, you could serve them however you’d like, and I promise they’d be a hit. And. They. Are. So. Freaking. Easy. They were in the oven in 5 minutes. Lit-uh-rally. Irish Shepherd’s Pie – This dish is definitely in my top 10… maybe my top 5… of go tos. It’s super easy and ends up delicious every time. My version isn’t truly shepherd’s pie since I use ground turkey (and I love ground lamb and beef, but I actually prefer the turkey here). I also ignore the instructions about mashing potatoes, and instead I grab a package of premade potatoes from the refrigerated section and just dollop those on top. Chicken Pot Pie with Puff Pastry Crust – I don’t think I’ve ever made an Eat Live Run recipe that didn’t turn out great, and this is my go-to pot pie recipe. Admittedly, you can find easier versions via Six Sisters Stuff and probably tons of other sources, but the additional time making the innards, to me, is made up for by just laying on some puff pastry and calling it a day. You could also save time by grabbing a rotisserie chicken and using that meat, but chicken breasts were $1.39/lb. at HT, so I grabbed plenty of those and added the extra cooking time in without issue. Also, probably the most recommended way to freeze this would be without precooking it… make the insides, let it cool, top with pastry sheets then freeze and cook when ready, but I precooked mine most of the way through, and when we’re ready to eat, I’ll let it mostly thaw then bake until the crust is golden. Easy Tamale Pie – I’d never made this before, but it came together like a breeze. I used ground turkey again, and I put the inside into a disposable dish, topped with the tamale “batter,” layered on cheese and froze. When we’re ready to eat, I’ll put it in the oven to bake it per the recipe instructions (which I wrote on the lid). Crockpot Chicken Tikka Masala – this is probably one of our top 3 or 5 favorite meals. Seriously so good. It’s more involved than my preferred crockpot recipes, but the end result is SO WORTH IT. My crockpot bowl actually cracked some number of weeks ago, and while we wait for the new one to arrive (this will be our third bowl… so either I need to learn to wait for things to cool down before putting it right in the fridge, or I need to cutdown my crockpot use), I’ve been making our favorites on the stovetop. Some of the results have been less than spectacular, but this one did GREAT cooking in a Le Creuset on low for 2-3 hours. It makes a ton, so I split it into two different batches to freeze, and when we’re ready to eat, I’ll just thaw, cook some rice and peas and pull some of our favorite Costco naan out of the freezer, too. One Pan Sour Cream Chicken Enchilada Skillet – this was also a new-to-me recipe. I made it last Thursday for dinner when David was off work, and it made enough that we ate that night + froze an 8 x 8 pan. I kept it fairly mild for the girls, but we loaded ours with hot sauce. When it’s time to pull it out of the freezer, I’ll reheat it with a little more fresh cheese on top. This is not #cleaneating by any stretch of the imagination, but in those early breastfeeding/postpartum recovery days, I’m already excited to dig into this pan of comfort food. Beef Bean and Cheese Burritos – I’m actually not a huge burrito fan. I prefer bowls of lots of toppings and rice. BUT, burritos freeze really well and should make one-handed eating a cinch. I made the meat using ground pork, and I’ve sent this link to 3 friends, telling them, “this is the best burrito or taco meat I’ve ever made.” I made 8 burritos and filled them with cheese, cilantro, frozen peppers and onions, and this meat. When it’s time to cook, I’ll brush on a little olive oil, a sprinkle of cheese, and maaaaaybe a drizzle of enchilada sauce. Lemon Feta Chicken with Oregano – Admittedly, this isn’t so much a traditional freezer meal, but this recipe was SO easy, and both of my girls really love eating chicken drumsticks. I didn’t really follow the recipe, other than a general sense of the ingredients. I made an entire family pack of drums (so inexpensive) and will use them for their lunches or dinners for a couple of days, and then we’ll vac the rest for life in the freezer. I anticipate that they’ll reheat really easily, though the skin won’t be as crispy anymore. Also, while they were cooking, Nora Beth said, “What is dat awful smell dat is the worst smell I’ve ever seen?” I think she meant the melting feta, but it certainly deter her from attacking hers when they were cool enough. Potato and Broccoli Cakes – I haven’t tackled these yet, but I’m going to make a batch to stow in the freezer for an easy veggie side for the girls, or even a savory breakfast option topped with scrambled or over-medium eggs for all of us. Moroccan Chicken with Herby Lemon Olive Vinaigrette – I know this will be a winner since I spelled “vinaigrette” correctly on the first try for the first time ever in my life. Also because Half Baked Harvest, while overly titled, is almost always a winner in a BIG way (her crispy pork ramen is life changing, and I actually want it right now). Again, not a super traditional freezer meal, but I will probably prep the marinade, pour over the chicken, vac it into bags and then pull out for a quick cook on our grill pan when we want a change of pace from comfort casseroles this summer. Summer Gnocchi with Corn and Smoked Sausage – okay. This one won’t go into the freezer, because the components just won’t reheat well, but I am making it tonight, and it’s a quick, easy one to have in a pinch that feels nicer than a peanut butter and banana sandwich (and I am in no way knocking a PB&B… they are divine). The reason this one is on this list is because it’s so easy to keep everything you need ready for it. Gnocchi is regularly on sale and can stay in the cabinet, I almost always have a link of smoked sausage in the freezer, and the rest of the ingredients are pantry staples. Caroline, thanks for your post and all the wonderful recipe options…praying all of His best for you and your sweet family…you are an encouragement to me and many others…congratulations on the arrival of Jane Ellis!